Curling at Crossmyloof from a long time ago!! Crossmyloof - even longer ago!! Many thanks to Lawrie Tyson - and indeed Morrisons - for this classic photo. Any bus enthusiasts out there that can put a date to it?? Hockey pictures are proving elusive - anyone got any?? As the new Millenium dawned, I was asked to write a few words about Crossmyloof, for the British Ice Hockey Writers Website. The website no longer exists, but I did manage to get a copy from the Webmaster at the time. My thanks to Jim Lydon. It wasn't much, but it was home. 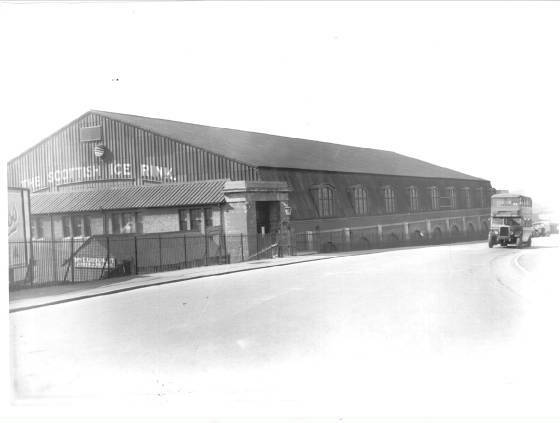 I first laced on a pair of skates at the old Crossmyloof Ice Rink in Glasgow. Nothing exceptional in that you might think, unless you had been there. Don't get me wrong, I loved the place and still have many fond memories of playing there, but I won't beat about the bush, it was a dump. Early morning games had to be played around the Zamboni at the top corner of the rink. This was because there was no garage outside to park it in.I'll save the blushes of the player who on more than one occasion skated towards it at full tilt with his head down. Well, you can imagine the rest! 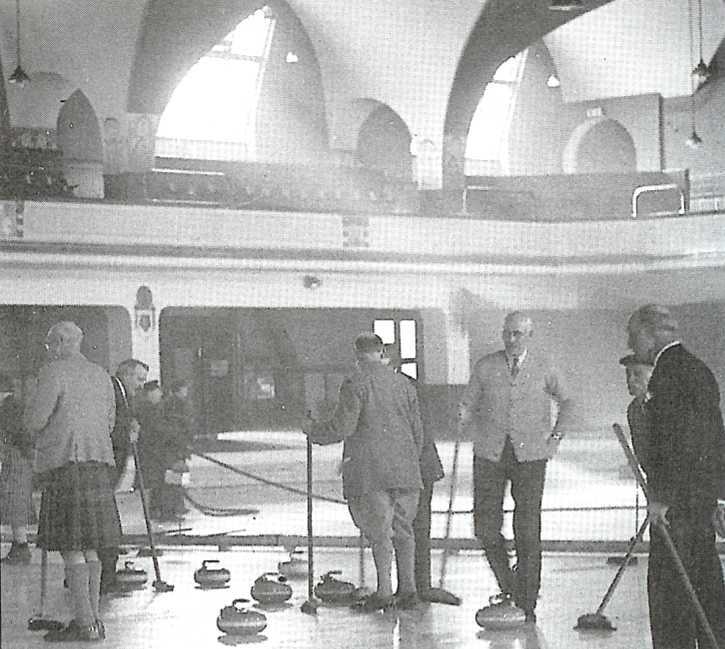 The building also had two Curling rinks, which were pristine. However the skating and hockey rink had all the charm and décor of a Beirut Post Office. It really did resemble a bomb site with an ice pad stuck in the middle. As such, as young players we dreamt of playing in a proper arena, with glass and electric scoreboards etc. The type of facility that thankfully is commonplace these days. 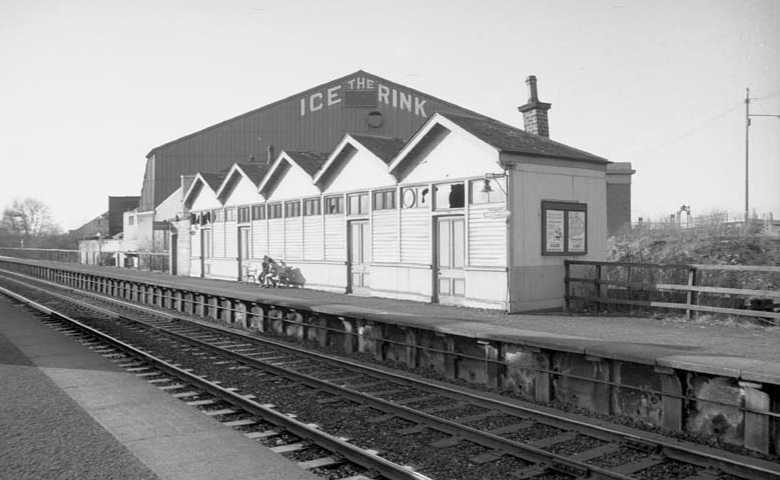 In fact so keen were we, many of us spent the summer months helping to paint the exterior just to please the owner, so that we would have ice to play on the following year. We were just kids. It creates a Dickensian image does it not? Thank God there were no chimneys, or I daresay he would have had us scuttling up them with a sweep in our hands. It's now a supermarket and despite not being particularly close to where we live, my wife and I sometimes shop there. Although Claire must be bored rigid with me pointing out to the spot just in front of the Delicatessen counter where I scored my first ever goal against Dundees Peewee team at the age of eleven. The tireless work put in by the late Sam Stevenson meant that we always had teams to progress to. Almost to a man, as junior players, we moved from the Pee-Wee Mustangs through the Junior Redwings and finally the Dynamos at senior level. It was the natural progression, and something all of us looked forward to with relish. Our heroes were John Hester and Martin Shields, and to later play on the same team as them, was to realise a childhood dream. Although the hockey club produced an almost limitless pool of talent from the late seventies through to the rink's demise and the clubs subsequent move to the ill-fated Summit Centre in the mid-eighties, unfortunately, many players left the club and moved away to other clubs to play. In fact, when you think of the players who left, what a team we could have had. Almost a full team left over the space of a few years. Perhaps for some of our more mature readers, these names will re-kindle some memories. John Tague, Gerry Anderson, Ian Appleby, John Matassa. Paul Heavey, Bobby McEwan, Ali Rodgers. Kenny Redmond, Tony Redmond, Kenny McKie, Gary Smith, Colin Wilson, Kevin King, Gary McEwan, Gary Shearer. As I mentioned earlier, the rink was far from perfect. The size of the ice pad, meant that it took the Zamboni too long to clean the ice between periods. It di't get done. I'm gonna need a motorcycle to get to the far end. The locker rooms were up on the balcony, and the only way down to the ice was via an unlit stairway. An unlit concrete stairway!! There were about 8 rubber mats randomly placed on the stairs and while we knew where they were, I'm not so sure our opponents did. Sparks literally flew before the game had even started. Oh and by the way, that was after you had squeezed by the couple winching on the stairs! One Christmas, and you have to believe me, this story really is true, we had to play around a huge Christmas tree at centre ice! A real Christmas tree, pine needles and all. The hoist that was supposed to raise the tree wasn't working, and the only way we could get a game, was to play around it. I kid you not, the same guy who tried to lay out the Zamboni, nearly brought down a 15 foot Christmas tree. Whenever former Glasgow players meet, you can guarantee that the stories about the old rink flow. In fact if you ever come across someone who played there, ask him about it, then sit back and be prepared to spend some time listening to tales that will have you wide eyed with amazement. It really was that kind of place. Like I said, it wasn't much, but it was home.